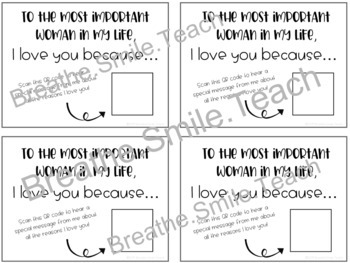 Are you looking for a unique way for your students to thank the most important women in their lives? 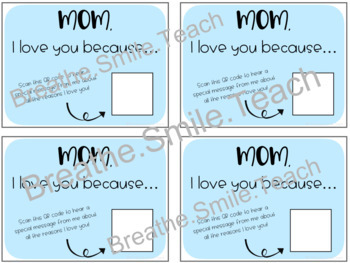 These Mother's Day cards allow students a chance to record a message to their mom, grandma, aunt, or other important woman and then draw a picture for them on the back! Moms and other caretakers will love having a video of the kids to look back on year after year, and students will love having a fun and creative way to express themselves. 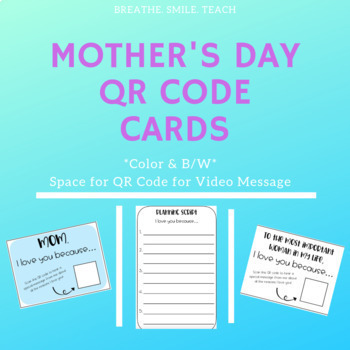 ★Color cards for "Mom", "Grandma", "Aunt", and "Most Important Woman In My Life"
★Black & White cards for "Mom", "Grandma", "Aunt", and "Most Important Woman In My Life" that students can leave plain or decorate themselves! ★Several options for the backs of the cards where students can draw a picture. Just choose which front you'd like to use, then choose the back template, and print the two slides double-sided. You can choose different cards based on students' unique situations. Then record a video and turn it into a QR code (instructions included) that parents can scan to watch over and over again!